OK. I liked this book. A lot. It's on my regular re-read list. 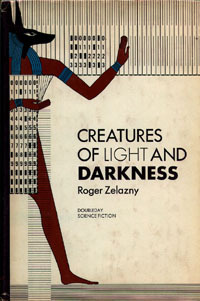 It features a universe where death and life are controlled by two poles, the House of the Dead, run by Anubis, and the House of Life, run Osiris. Anubis and Osiris cooperate and compete at the same time. Anubis has gotten ready an emissary, who he has been training for a thousand years, to kill his greatest enemy. It can be argued that this is one of the most influential Science Fiction books ever written. It certainly is one of the most beautifully written. You can always count on Mark Twain. What he doesn't mention is the climate includes rains of fire flakes, hell horses, demons, devils, lawyers, and billions of the Damned, many of whom weren't exactly the nicest people in life. 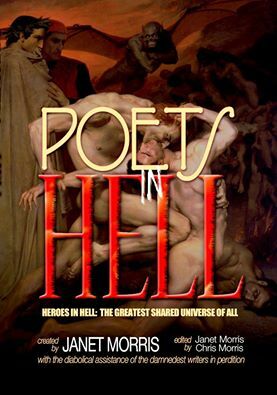 Hell is an Equal Opportunity kind of place. Mess up, and you'll end up on Slab A being worked over by the Undertaker, who isn't the most pleasant chap. Really mess up and Satan will display your still living body parts for all to see, before sending you to the Undertaker. The Damned are in Hell for punishment. And punished they will be, often by other of the Damned. King or beggar, Hell will be one Hell of a trip for all of them. A short trip in many cases. Back to the Undertaker, who sometimes makes minor mistakes, like putting your arms where your legs are supposed to go. You've got to pity the poor guy though, he's just been swamped since Guy Fawkes used a nuclear weapon on the Hall of Injustice. This is the seventeenth book in the series, and no, you don't need to read the earlier books first. Janet Morris has done her usual incredible job of pulling together a group of talented writers, and sending them on a mission to help with the punishment. 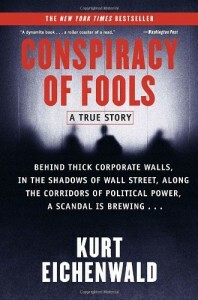 Conspiracy of Fools is a fascinating book about Enron. Yep, that Enron, the company that killed so many people's retirement plans. The story of what happened is fascinating. The presentation is good. The writing is good. But I was less than satisfied with the book as a whole. This is a common problem for books covering current events. The book ends before it should. It doesn't tie the problems at Enron into the problems that brought about the mortgage crash, which are effectively the same. Also the book doesn't include even the simplest basic charts, which would show how the schemes that were used to move assets off-book worked. The same schemes that the banks used to package up non-performing mortgages, and move them off book so they wouldn't have to record a loss. But there's a huge amount of historical information in the book, and it is well worth reading, even if it could have been so much more.